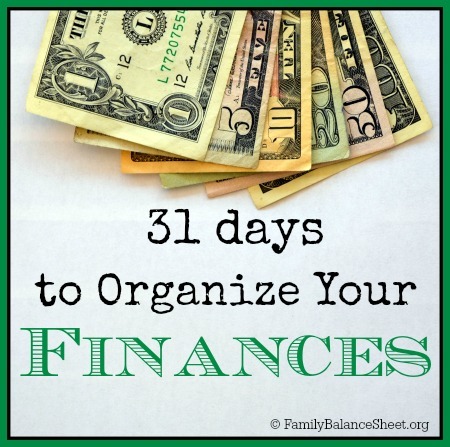 Welcome to 31 Days to Organize Your Finances. By the end of the month, my goal is to help you have a detailed financial plan for your family. We’ll talk about cash flow, budgets, debts, and all of the nitty gritty of our finances that might not be fun to talk about, but are so important to discuss. Please refer back to the original post for a complete list of daily assignments. Today’s assignment: List your SMART financial goals. If you’re married, you must do this with your spouse. 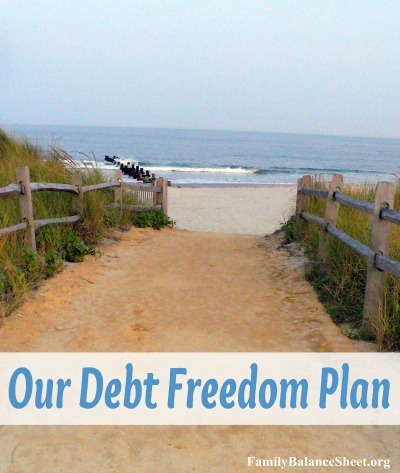 Earlier this year, my husband and I wrote a specific list of financial goals and named it Our Debt Freedom Plan. Prior this plan, we had set goals, but never before had we been so specific with a step by step approach. We used Dave Ramsey’s principles from his books, The Total Money Makeover and Financial Peace as a guide to create a step by step plan on how we will achieve our financial goals. We altered his principles though to reflect our lifestyle. Too often we only think about goals in January, but today we’re going to work on new financial goals. Is it to pay off your house? Pay cash for a trip to Hawaii or your kids’ education. Or maybe you want to pay off (and cut up) your credit cards. Only you (and your spouse) can identify what’s important for your finances. When writing goals, you want to make sure they are S.M.A.R.T. goals, rather than ambiguous goals. Instead of writing, “I want to pay off debt” or “I don’t want to live paycheck to paycheck”, refer to your recently completed balance sheet and craft S.M.A.R.T. goals. Back in 2011, I made a goal to complete a half marathon by the end of that year. It was a bold goal for a girl who had only run a 5k up to that point. I gave myself most of the year to train for this very specific goal that was measurable and completely achievable. I followed a training plan and had the support of my family. I trained consistently for that one race and when I completed the half marathon, I felt so empowered that my goal in 2012 was to run TWO half marathons. And you know what? I’m running my sixth half marathon this month. Long distance running is now a hobby and my training is a habit. This assignment might take you a few days. Take time to write the goals thoughtfully, but try to have them done by the end of the weekend. After you devise your new financial goals, we’d love to hear them. If you feel comfortable, let us know what they are in the comments. Disclosure: I am an Amazon Associate, and if you make a purchase through my link, I earn a small percentage–at no cost to you! Thanks for supporting Family Balance Sheet. You can read the site’s full disclosure here. Please note, I AM NOT A FINANCIAL PLANNER. This series was written based on my family’s experiences. If you feel you need additional advice, please consult a certified professional. I love the idea of SMART goals. Our #1 financial goal is to pay off our mortgage. Unfortunately for us, our income is inconsistent and unreliable so it is difficult to have very specific goals. Ours is more a desire than a measurable, timed goal due to that fact, When we were getting out of credit card debt years ago, our income was more predictable and we were able to do it the SMART way. Great advice here! Thanks Heather! Paying off our mortgage is a goal of ours too, although we have some other debt that we need to pay off first. Thanks for these post. My husband and I are working on getting out of debt. Sometimes we feel lost as to what to do even though we have the smarts to do it. 🙂 Thanks for the S.M.A.R.T. goals plan.